Powell made the speech in Birmingham in 1968. THE BBC HAS been forced to defend its plans to broadcast a full recital of Enoch Powell’s Rivers of Blood speech, a controversial speech given by a Conservative MP in the 1960s that urged Britain to reduce immigration. The decision to broadcast the speech on Radio 4 has been slammed by Labour peer and former Transport Secretary Andrew Adonis. He tweeted that it is “is the worst incitement to racial violence by a public figure in modern Britain” and wrote to broadcast regulator Ofcom to ask that it instruct the BBC not to air the programme. It’s not an endorsement of the controversial views and people should wait to hear the programme before they judge it. But other journalists have warned that broadcasting these views will normalise them. “The BBC’s decision to promote Enoch Powell’s ‘Rivers Of Blood’ speech is just another example of the creeping normalisation of racism,” Mail on Sunday commentator Dan Hodges tweeted yesterday. The BBC’s decision to promote Enoch Powell’s ‘Rivers Of Blood’ speech is just another example of the creeping normalisation of racism. The speech was divisive, and resulted in Powell’s expulsion from the shadow Cabinet. Though of course, some will still object,” he added. Criticisms have also been levelled at the BBC for the way that they have promoted the show. One individual who had been interviewed for the programme said on Twitter that she was “disgusted” by the way it was promoted. “I made a mistake and was interviewed for this but I have been sick with worry since seeing the way this is being presented,” Dr Shirin Hirsch, who researches Powell at Wolverhampton University, said. The speech is due to be read by actor Ian McDiarmid on Saturday to mark its 50th anniversary. 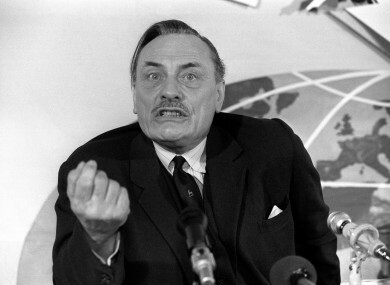 Email “BBC defends plans to broadcast Enoch Powell's Rivers of Blood speech for the first time”. Feedback on “BBC defends plans to broadcast Enoch Powell's Rivers of Blood speech for the first time”.